Proteins are a large class of biological molecules consisting of chains of amino acids called polypeptides. A single polypeptide can make a protein, although many proteins consists of multiple polypeptide subunits. A protein may consist of a single polypeptide or multiple polypeptide subunits. 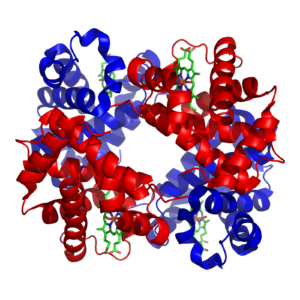 Some proteins include non-peptide groups, called cofactors. A cofactor may be an organic group (e.g., coenzyme, prosthetic group) or an inorganic group (e.g., metal ion or iron-sulfur cluster). Each polypeptide is a linear molecule made from a string of amino acids that are bonded into a chain by peptide bonds. An organism’s DNA or RNA codes for the sequence of amino acids that form proteins. Building each amino acid chain from the genetic code is termed translation. Once a polypeptide has been translated, it usually undergoes additional chemical changes, called posttranslation modification.